Feb 1, 2019 | What Am I Reading? 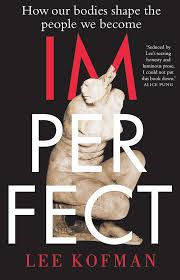 Imperfect (Affirm Press 2019) is a remarkable, frank and questioning exploration of bodily imperfections and how we are shaped by them, from author Lee Kofman. This non-fiction book is distinguished by Kofman’s searing curiosity about her own scars and also the imperfections of others, a quest that she bravely embarks upon with enthusiasm and gusto, not so much to provide answers but rather to simply articulate all the possible questions, and in doing so, she carries us – the reader – along with her as she recounts her own story and researches the unique stories of others. Kofman bears her own scars, the result of several (ham-fisted) heart surgeries in the Soviet Union when she was a young child, and then significant scarring to her legs after being run over by a bus (driven by a drunk driver) when she was 10. From aged 11 onwards, her body carried significant physical scars that shaped her view of herself, how she felt others viewed her, and her own interactions with the world. Now in her forties and a mother of two (one boy with albinism – yet another ‘imperfect’ body), she has spent her life either using the scars as a badge of honour or else hiding them away in embarrassment. In this memoir, Kofman relates her early life in Russia, her formative years in Israel, and her subsequent life in Australia with an unflinching gaze in her search for honesty, truth and understanding. She questions the notion of beauty and the myths surrounding physical perfection. She seeks to comprehend what it is really like to live in a body that deviates from the norm. Her research covers everything from facial disfigurement to amputations, from severe burns to dwarfism, from larger-size women to those with mastectomies, always asking the question: why does culture and the media tell us we should look a certain way? Why do WE tell ourselves we should look a certain way? Then she turns this argument on its head by asking: what is wrong with wanting to look beautiful and be accepted? Why can’t the pursuit of beauty and the acceptance of imperfection co-exist? She investigates why some people are attracted to those with imperfections or scars, and why some people are drawn to scarring themselves, such as in extreme body modifications. This is a book for any woman (or anyone, really) who has ever hated the way they look, despised a particular physical flaw, worried about how others view them, or been anxious about their appearance. It would also be a great book for adolescents struggling with self-esteem and self-confidence. This book will make you rethink your notions of beauty, tolerance, difference and diversity. It discusses Body Surface, shaming, feminism, self-image, celebrity, isolation, love, desire, grief, stigma, coping strategies, transformation, metamorphosis and the fine balance between fragility and resilience. And the most appealing aspect of the book is the way this is done: Kofman is an academic, and her research and findings are meticulously noted and sourced, and yet she manages to tell a tale that is almost child-like in its wide-eyed curiosity, asking questions that most of us have considered but never been brave enough to voice, and peppering her solid academic records and philosophy with references to pop culture and modern circumstances. She has also interviewed hundreds of ‘imperfect’ people – some in person and at length, some through Facebook call-outs – and incorporated their own individual stories into her account. At every stage, she learns something new, shares this with the reader and then questions it. Every discovery leads her down another rabbit-hole and she is never afraid to admit to her own insecurities, her own ignorance and her own prejudices. In this way, we – as readers – feel safe with her on this journey of discovery. We feel that we will never be judged for our opinions or views but are only encouraged to open our minds and consider all the possibilities.